CB-450 - NexSens Technology Inc. The CB-450 is light enough to be deployed from most small boats, yet it offers adequate power and charging for rigorous instrument sampling and data transmission. 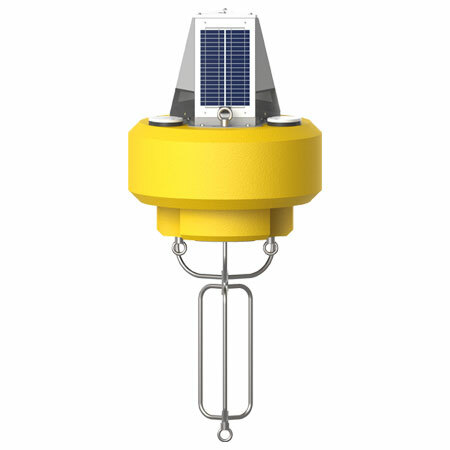 Three integrated solar panels are angled and evenly spaced around the buoy to capture sunlight from any direction and provide adequate battery charging. A 10-inch diameter by 18-inch tall data well provides a watertight housing for batteries, data loggers, sensors, and other hardware. The data well lid provides pass-through connections for sensors, power, venting, and more. When integrated with the optional NexSens data logger and connectorized lid, the system is truly plug-and-play. Three 4-inch pass-through ports allow for sensors to be mounted underwater while securely routing the cable. Instrument deployment pipes and custom sensor mounts attach to 4-inch NPT bottom threads. The data well lid is pre-configured to accommodate the NexSens data logger. Alternatively, 3rd party data loggers can be housed inside the data well. Waterproof telemetry modules securely mount to the buoy top plate. Communication options include radio-to-shore, cellular and Iridium satellite. Constructed of cross-linked polyethylene foam with a heavy polymer skin and an indestructible stainless steel frame, the CB-450 is designed for years of service.